The college football gods have smiled on two lucky players, as our championship week is set after a bevy of big performances in the semifinals. And HERE.............................................. .are the semifinal results. gr8, yet again, was just too strong. He got a trio of 40+ point performances to lead him to victory, as his CIAA QB Bryce Witt led all starters with 49.35 points this week. He got help from teammate Tyrell Freeman, who had 40.6 points, and Cameron Mayberry scored gr8 43.3 points, as those three alone accounted for 133.25 points, enough to win this matchup on their own. ship got 43.85 points from QB Amir Hall, and 41.4 points from Wes Hills, but couldn't get more than 13.2 points from any of his other four starters. There was nothing he could do, regardless. In our tightest match-up of the weekend, the student showed the teacher yet again who is boss, and our reigning champion has relinquished his title. NSM had five starters score between 22.1 and 28.9 points, and the would-be top two scorers on his team were on the bench, but he still got away with the victory. MM had the two highest scorers in the active lineups with RB Kevin Coy Jr.'s 32.9 points and QB Isaac Harker's 32.35 points, but he had two players score in single digits, which was the death knell. That gives us a worthy title game...as #1 gr8ness97 will be taking on #2 New School Mule. It will be only the third time in league history where the top two seeds will meet in the championship. gr8 will be searching for his first title, while NSM will look to win his second (2016). In the loser's bracket.....womp womp. RC got his usual good performances from his CWU guys, as QB Reilly Hennessey led the way with 33.85 points, followed by RB Michael Roots' 27.1 points. 08LB got 32.2 points from RB Vincent Johnson, but he didn't really stand a chance, as QB Nick Rooney was a DNP for Adams State in an exciting game. I continued my absolute garbage playoff performance, as I played the wrong QB to lead myself to loserdom. Benched QB Eystin Salum's 53.75 points were the most in the league this week. Fail. I got 42.8 points from RB Tabyus Taylor in my spectacular losing effort. Ian got 44.6 points from WR Trey Brock, as well as 31 points from WR Lansana Sesay and 30.8 from RB Xavier Turner. He didn't need to fret over Nate Gunn's 30.1 points on the bench. 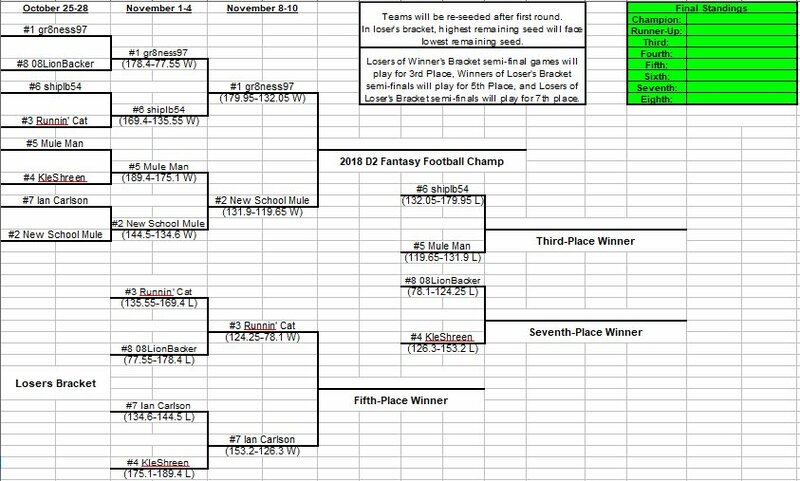 Here is your updated bracket going in to title week! We do have a couple games on Thursday this week that involve our league. So lineups this week will be due by THURSDAY, NOVEMBER 8TH, AT 6 P.M. EASTERN. Please note that it is THURSDAY!!! I would like to avoid making any roster moves this week if possible, because I don't want any match-ups, particularly the championship, to be determined by picking up a bunch of guys playing crappy opponents. I'm not saying people can't make roster moves, but just suggesting it out of the goodness of everyone's sanity and to avoid issues that may arise from such a thing. You know what to do. Please clearly mark starters and bench, with starters including 1 QB, 2 RB, 2 WR, and 1 RB/WR flex position. Copy-paste your roster from below, and put your lineup in the same format as mine below. Last edited by KleShreen; 11-06-2018 at 02:11 PM. I demand PED testing of greatness! lol why did you pick up Benson to not play him? You're assuming I wanted to play him. He picked him up so no one else could use him against him! Have greatness' test results come back yet? I am pretty sure I should be playing for the Championship, he has been juicing! As one infamous poster likes to say......ROIDS! I would like to share the Bryce Witt had nearly 50 points last night and he is on my bench. Tyrell Freeman did have 40 though and he is in my lineup. Ive had a CIAA Running back in my lineup every week except 1 I believe.